High blood pressure, or to give it its correct name - hypertension - affects 1 in 4 people and is a major risk factor for the development of stroke, heart disease, kidney disease and vascular dementia (1). There are many factors involved in the development of high blood pressure including age, genetics, physical activity levels, lifestyle choices and food. Making alterations to some of these factors can give profound improvements on blood pressure. Our mission is to provide you with insightful information. We always take an evidence-based approach and aim to provide you with actionable knowledge and tips to help you on your journey to optimal health. 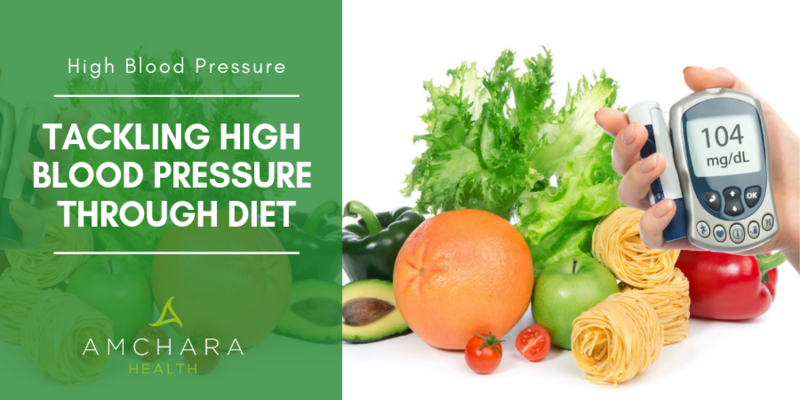 In this article we discuss which foods may be beneficial for blood pressure management and why. Nutritional alterations are known to give significant benefits to blood pressure and two diets that are often linked with a healthy blood pressure are the Mediterranean diet (2) and the DASH diet (3). The Mediterranean diet includes fruits, nuts, vegetables, legumes, olive oil, oily fish, and is low in meat and dairy. It not only supports the cardiovascular system but also has anti-inflammatory properties. The DASH diet has many similarities to the Mediterranean diet and focuses on whole foods, oily fish, poultry, fruits and vegetables and low-fat dairy. Fruit and vegetables contain a vast array of healthful vitamins, minerals and plant chemicals that all work together to keep the body functioning effectively. Key nutrients when it comes to blood pressure include potassium, magnesium, vitamin C, anthocyanidins and flavonoids. The balance between potassium and sodium is important - too much sodium and not enough potassium directly leads to high blood pressure. Magnesium is known as a muscle relaxant and may aid in relaxing blood vessel walls. Vitamin C is well known for its role in immune functioning, but it is also needed to support a healthy cardiovascular system. Anthocyanidins, found in dark purple and red fruits and vegetables, and flavonoids, have been shown to be protective of blood vessels and also to reduce further damage from high inflammation. Although it is suggested you should eat 5 portions of fruit and vegetables a day, many experts now believe that around 8-10 portions a day gives the most benefit. There should be a focus on more vegetables, rather than fruit, as they are lower in natural sugars. Eating a wide variety of fruits and vegetables and ‘eating a rainbow’ daily ensures a variety of important nutrients are provided. A rainbow food chart or wheel can be used to track your daily intake. Fibre is rich in foods like whole grains, fruits and vegetables, beans, lentils, nuts and seeds. Although fibre is not digested and absorbed like other nutrients it plays an important role in health. Fibre helps us to stay fuller for longer and so can help to control appetite. Being overweight or obese significantly increases blood pressure and the risk of other cardiovascular complications. Including a good amount of fibre in the diet daily can help combat weight gain. The complex eco-system that live in our gut, called the microbiome, feed from certain fibres and therefore a good intake helps them to flourish. You may be aware that the balance of organisms in our gut help with gut health and immunity, but research also shows that they may affect blood pressure. An imbalance in gut bacteria, also called dysbiosis, is associated with obesity (8) and high blood pressure (9). Water is essential for life and the amount of water you drink may impact blood volume. The higher the blood volume, the more work the heart has to do to pump it around, which may lead to an increase in blood pressure. This makes it sounds as though you should drink less water, but this is not the case - the body keeps everything in balance and sodium (from salt) and water are kept to a set level. Having a healthy water intake, of around 8 glasses (2 litres) a day is beneficial. Beetroot juice - beetroot stimulates the production of a compound that can help to open up blood vessels, allowing better flow and therefore less pressure (10). Pomegranate juice - one glass a day reduces blood pressure and it is thought that this is due to the polyphenol content supporting blood vessel wall function (11). Coconut water - rich in potassium, studies have shown a daily intake of coconut water significantly reduces blood pressure (12). Hibiscus tea - known to be high in antioxidants, 3 cups of hibiscus tea a day have been found to have positive effects on blood pressure (13). A word about tea and coffee - both contain caffeine which has diuretic properties and can lead to water loss from the body. The evidence on whether caffeine containing drinks impacts blood pressure is mixed. In one study, people who regularly had caffeine containing drinks experienced less of an effect on blood pressure than those who were not regular caffeine drinkers (14). It is suggested to keep caffeine intake low and don’t automatically reach for decaffeinated versions as these may also cause a rise in blood pressure, indicating that it is not just caffeine that plays a role. The essential fatty acids have many functions within the body and provide cardiovascular support. The balance between the different types of essential fats is vital for their functioning. Omega-3 fatty acids found in oily fish like salmon, herring, mackerel, sardines, trout and tuna, have anti-inflammatory properties and assist with cardiovascular health. Omega-6 is generally high in the diet and is found in vegetables oils, nuts and seeds and is often high in processed and packaged foods. If there is too much omega-6 and not enough omega-3, this can create a situation where there is a high level of inflammation. This may lead to damage of blood vessels, and inflammation has been linked to high blood pressure (15). A good intake of oily fish - at least 2-3 portions a week - and daily intake of walnuts, chia seeds and flax seeds may increase your omega-3 level and help to reduce inflammation. Avoiding packaged, processed and fast foods can also help to reduce omega-6. Olive oil contains omega-9 (oleic acid), which has also been shown to have cardiovascular supportive actions. In studies it clearly lowers blood pressure (16). Olives and olive oil are a major component of the Mediterranean diet and this may be one of the reasons it is so beneficial for the cardiovascular system. Protein slows digestion down and therefore the release of energy is slower. This not only keeps us fuller for longer, helping to manage appetite and body weight, but also keeps insulin release within healthy levels. A high level of insulin and insulin resistance (a condition where body cells are ‘deaf’ to the effects of insulin) is linked with high blood pressure (17). With this in mind. it would also be beneficial to address sugars and white refined foods. Good quality protein can be found in eggs, white fish, oily fish and in organic grass fed meat and poultry. There is a distinct difference in the balance of essential fats in organic grass fed meat and poultry compared to animals raised in other conditions. Grass fed meat and poultry is richer in omega-3 fats and lower in omega-6 fats - further supporting a healthy balance and lowering inflammation. Some foods may be detrimental to blood pressure and should be avoided or reduced. Salt - keep to 6 grams or less a day and be aware of hidden salt in many packaged and processed foods. Saturated fats - although there is some conflicting evidence on their impact on blood pressure it is wise to keep them low. They can be found in red meat, dairy, fried foods, takeaways and baked goods. Trans fats - known to cause damage to blood vessels, they are best avoided entirely. They are found in foods such as margarines, deep-fried fast foods, bakery products, packaged snack foods and crackers. Alcohol - keep intake lower than the suggested 14 units a week. Sugar - sets off a cascade of damaging effects to blood vessels due to disruption of blood sugar. Be aware of hidden sugar in food - always read the label or better still cook from scratch. The evidence is clear that a healthy, balanced intake of a variety of foods can help with blood pressure management. It could be argued that if this kind of healthy eating was more common that there would be less incidence of high blood pressure in the first place. If you would like support with your health, then one to one personalised advice from a qualified and experienced practitioner can be useful to help you to make the most effective changes and to reach optimum health. We are dedicated to providing insightful information on key aspects of health - all orientated towards the personalised health approach. Have you made dietary changes to help with your blood pressure? Please share your thoughts and knowledge below.